The Window Film Company offer a wide range of window films designed specifically for use in your home. Our products have been solving glass related issues such as heat, glare, privacy and safety since 1998, so whatever the situation with your windows and glass, The Window Film Company can help. In this, the residential section of our website, we aim to provide you with as much detail as possible about the films we offer, and the way they work and perform. The list below shows a few common problems that can be solved or improved with an application of window film, but it is no means exhaustive. If you’ve got any issue with your windows that aren’t shown below, do give us a call on 01494 794477 – we’ve been helping customers since 1998 there isn’t much about the world of window film we don’t know! Heat: Windows can often contribute to uncomfortable temperatures. This is especially frequent in rooms with lots of glazing such as conservatories. Our range of solar control films can help prevent heat build-up. Privacy: Privacy can be an issue for a range of reasons. Whether it be preventing being overlooked by neighbours or stopping passers-by seeing into your property, we offer a number of privacy window films (including our popular Frostbrite frosted film) that can provide you with the finish you require. Safety: Glass can be a fragile material, so if you have young children or pets, or are simply concerned about your windows breaking, an application of safety or security film will protect your glazing and give you peace of mind. Fading: Sunlight streaming through your windows can cause furniture and flooring to fade. The Window Film Company supply and install specialist film that will cut down the unwelcome effects. All of our window films are available on a DIY basis via our online store or can be fitted by one of our teams of qualified installers. 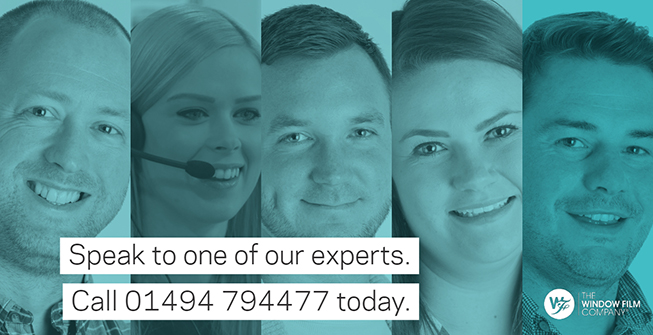 We also have a vastly experienced team of Residential Account Managers available to answer any of your questions, so to discuss your requirements or for further information and advice about any aspect of window film, call us on 01494 794477. We’ll be happy to help.